Website readers won’t trust you, they’ll trust other people’s recommendations of you. But just how do you gather (and edit to perfection!) those testimonials that will seal the deal in your clients’ mind before you even have to ask for the sale? Well today I’m going to share my simple 7-step process for asking for (and getting!) amazing testimonials that will sell your services for you. YES! I want the workbook! Why Are Testimonials So Important For Getting Booked Online? Testimonials are so important to the legitimacy and backing of your business online, their importance almost can’t be overstated. If you don't have high quality testimonials on your site, it really brings questions into the mind of the reader about if you are a business (and person!) that they can trust. People are constantly looking for online reviews nowadays to psychologically back up their feelings of excitement about investing in your business and booking with you. 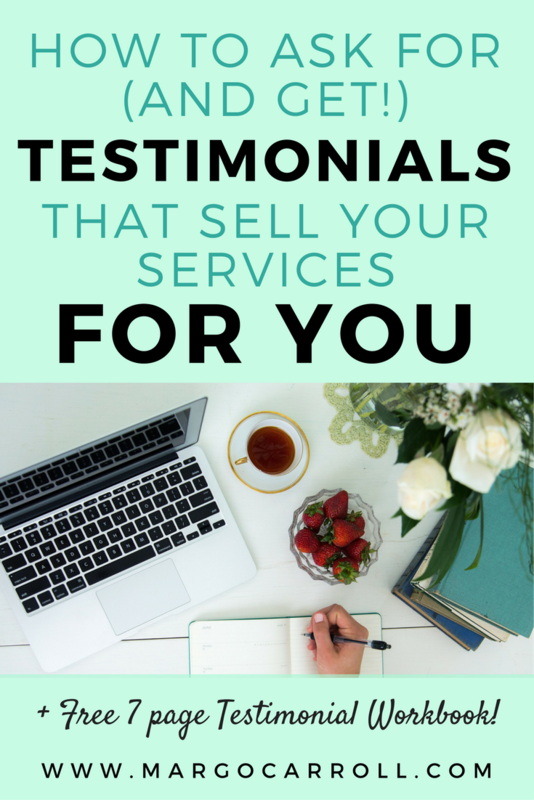 An enthusiastic testimonial is hands-down one of the best tools to get readers practically throwing their wallet at you with excitement over your offering. Not to mention, a good testimonial saves YOU time on writing your website copy. Instead of having to come up with something creative to say about yourself, the glowing words your client wrote speak for themselves! But just how to do you get clients to take the time to write such an awesome testimonial for you? You’re going to make a plan, use a strategic process, and cash in on some incredible client reviews! So you know that you definitely need to have social proof on your website if you want to keep up with other businesses in your wellness industry niche. But what’s the right way to approach people for testimonials that feels natural and not sleazy? And how do you get people to say “Yes” when you ask for their feedback? 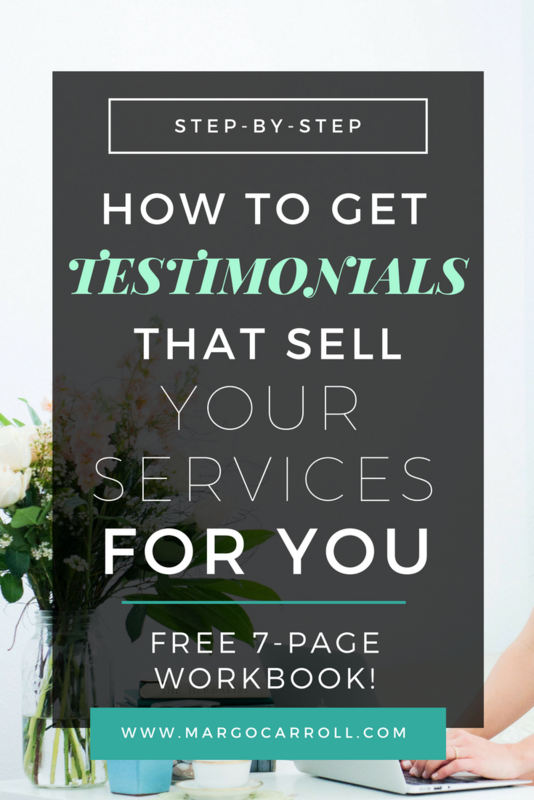 Let’s dig into the seven step testimonial gathering process that I use (and I teach my students to use) to gather testimonials that are one-of-a-kind and get readers excited about booking with you. So the first step in the process is to collect all of your views that you already have for your business. These could be Yelp reviews, Google Business Reviews or reviews that were emailed or even texted to you. You're going to collect all of these into one document. You can collect these all together however you like, but my personal preference is to use Google documents for this (Yes, I’ll admit it: my whole life is organized in Google Docs. #noshame). What are the keywords that people keep using to describe you in their positive reviews of your services or products? And which are the very best reviews? From the document you created with all of your best reviews, you're going to identify five to ten raving fans. These are people that are super excited about your work, and who you can tell would already recommend you to their friends without you even asking them to do so. Now you’ll go ahead and create a tracking method to keep track of who your best reviewers are, I use a spreadsheet for this to keep everything organized. Write these names and their contact info down in your spreadsheet. So what I'd like you to do instead, if you haven’t had a paying client yet, is to go through a list of all the friends, family, or acquaintances that you've worked with using the types of services that you're going to begin charging for. For example, if you’re starting a health coaching business and you've been helping people with nutrition advice that you haven't been charging for, add those folks to your list of people to request testimonials from. Or maybe you’re a recently-certified pilates instructor about to start your own practice. You’ve never taught a class before, but you've been teaching some stretching techniques to family members—there you go, those can be testimonials! If they give you a testimonial about how the work that you did for them for free, they don’t need to say that it was for free. The testimonial shares what you did that was really helpful to them and helped them achieve some kind of transformation in their life. It’s time to roll up your sleeves; now we get to the real work! You’re going to request phone interviews with your five to ten raving fans to gather more information for a really well rounded testimonial. Doing this via a phone interview allows you to get even more detail from them about what the struggle was that brought them to you, and how you solved it for them. You’ll reach out to those five to ten people that you identified, and you're going to ask them for a 10 minute phone call to help you improve your business and the offerings that you have. That can be a little intimidating for people, not because they're not excited to help you, but because they just don't know what to say when they feel put on the spot. Just let them know it'll be a quick phone chat and it will really help you to improve your business and offerings. So you're going to actually sit down get on the phone or Skype with those clients (or friends and family, if you're just starting your business) and do an interview with a very very clear list of questions. I'll be honest with you the quality of the testimonials from my clients and for myself and my own business has really depended on how clear I was about the questions that I asked when I gathered feedback. You can't go into this with no idea of what you're going to say because—like I said—when people are put on the spot they won't really know how to respond and you’ll get lame answers. So it’s crucial that you have a very clearly outlined set of questions that you're going to use to gather feedback from your clients. I have a client feedback form that I've used for the last couple of years in my business and I honestly think that it's the number one thing that I can attribute the positive testimonials that I get to. It’s not just because of the quality of my work, but also the fact that people have a clear question that they're answering and they understand what the information is that I’m looking for when I ask them for feedback. And then at the end of the form, of course I gather their permission to use their photo and the words that they've shared for testimonials as well. Now, you’re going to complete your individual interviews with your clients! Be sure to keep track of your outreach, interviews, and follow-up communication in that spreadsheet that you started! You’re then going to send a follow-up email right away thanking them for their help with this project. For an optional (but always appreciated) bonus, you can send a surprise “thank-you” gift to those who participated! Now steps 5, 6 and 7 are really the most critical steps of this whole process. It's what brings it all together for you and you're going to have to download the testimonial worksheet that I've created for you. You can get Steps 5, 6 and 7 of the Testimonial Gathering process by Downloading the Free Testimonial Success Workbook right here. 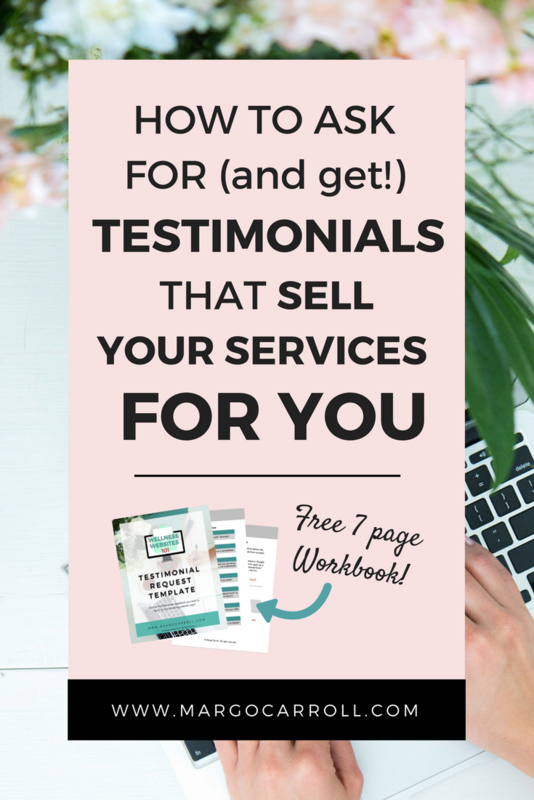 The 7 page workbook walks you through the full 7-step workflow to getting your incredible testimonials, as well as giving you my full Testimonial Request Template that you can customize with your information and send out to your own clients! It doesn’t get any more done-for-you than this! I want you to see this whole seven step process all in one place and then go ahead and actually implement it for your business, so go grab your workbook now, get started, and then let me know how it’s working for you! When you start gathering these testimonials, I want to hear all about how the workbook helped you get there. So just to recap, we went through the first four steps of my seven step testimonial gathering process that's really going to knock the socks off of your website readers. These kind of juicy testimonials will get your audience super excited to book with you because they can see how much other people have loved working with you. I can wait to hear how this process (and the Testimonial Request Template I’ve given you in the download) work for you! If you’re ready to implement these steps and fill your website with testimonials that sell your services for you, download the 7-Page Testimonial Success Workbook as part of the free, beginner-friendly e-course—Wellness Websites 101—so you can put all this (and much more!) into practice.